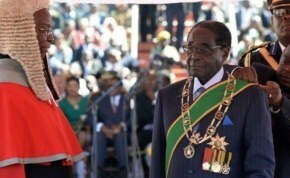 Zimbabwe's President Robert Mugabe has been sworn in for another term, which will extend his 33 years in power by another five years. Thursday's swearing-in ceremony for the 89-year-old leader had been delayed by an election challenge from rival Morgan Tsvangirai's MDC party. The MDC said the July 31 polling was rigged. However, on Tuesday, the constitutional court dismissed a challenge from the opposition party. Outgoing Prime Minister Tsvangirai said he had no plans to attend Thursday's inauguration. A Tsvangirai spokesman said the election was "stolen" and the prime minister could not attend a party hosted by "robbers." Mugabe has ruled Zimbabwe since the country won independence in 1980. His ZANU-PF party and the MDC previously were the main parties in a power-sharing government formed under SADC pressure after the disputed and violent 2008 elections.